Victoria is the Society’s flagship. She was built in 1972 and after spending time on various parts of the English Grand Union Canal was moved to LUCS in 1978. She has been with LUCS ever since. She can carry up to 12 passengers and is an open boat which offers great views. She has screens that can be lowered to give some protection against the weather. For private hire a central table can be installed between the passenger benches. Victoria is a replica steam packet boat. At around 36 feet (11 metres) long by 6 feet 6 inches (2 metres) wide, she has a draught 2 feet (0.6 metres) and weighs 6 tons. She has a 3 cylinder Kubota diesel engine and has hydraulic steering. Victoria was built in 1972 by Braunston Boats in Daventry, Northamptonshire. She was fitted out by her designer and first owner, Derrick Hughes and his mechanic, Mick Silver over the winter of 1971/72. In 1972 Derrick ran her as a restaurant boat at Knowle Bottom Lock on the Grand Union Canal. A footnote is that Derrick and Mick “found” their boat again in Linlithgow and had a great day out with their “child”. Two years later Victoria lost her propeller in the basin. It was found the next day and reunited with the shaft. That was the day that Derrick Hughes died. Although Derrick’s venture was popular, it was not particularly profitable. As a result in 1974 she was offered for sale with offers of £3,500 invited. She was then acquired by High Line Yachting of Iver, in Berkshire who operated her along the Slough Arm of the Grand Union Canal. This was evidently not successful so in 1976 she was bought by David White who reported that she was “in a tatty state by then”. David refitted her at Thurmaston, near Leicester. He then moved her to the Welford Arm of the Grand Union Canal near Rugby where she offered 1 ½ hour trips which included a passage through Welford lock. David recorded that in 1977 she did 51 trips, carrying 422 passengers with an income of £246 and expenses of £282. As he had other projects at this time he then offered Victoria for sale at £4,000. 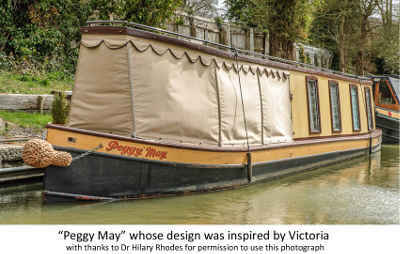 One of these projects was his boat “Peggy May” whose design was strongly influenced by Victoria. At this time that LUCS, in the form of John Aitken and Bill Watt appeared on the scene. John had seen Victoria advertised for sale and after taking part in the London Canal Marathon he and Bill went to see Victoria at Welford, near Rugby after responding to an advert. She was purchased around Easter time after LUCS has raised funds and obtained a grant of £2,000 from West Lothian Council. She was craned out at Welford 10th March 1978 and the following day was moved to Armadale where her hull was painted. She arrived at the Linlithgow canal basin on 12th March 1978 ready for the start of her first season with LUCS on 25th March. Victoria has been with LUCS since then. As the Society’s flagship she has travelled the Lowland Canals between Glasgow and Edinburgh to represent LUCS at various key events. At the opening of the canal bridge under the M8 on 7th May 2000, Victoria met the Pride of the Union from Ratho. At the opening the Falkirk Wheel on 24th May 2002, Victoria was one of two boats in the first rotation, sharing the caisson with the Govan Seagull. Keeping Victoria in service over all this time involves a lot of work. In 1992 she had a major refit costing £5,000 which involved renewing all woodwork after she was stripped to bare metal, the steering converted to hydraulic operation and her single cylinder 10 hp stripped and rebuilt. In 2001 she had another major refit when the diesel engine was replaced by a 3 cylinder Kubota gifted by Jem Engines of Lauriston and Beta Marine gifted a new gearbox.